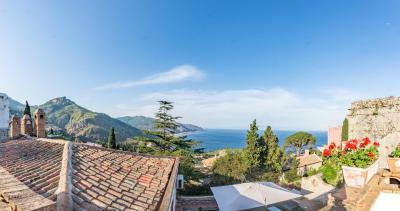 Lock in a great price for Hotel Villa Fiorita – rated 9.3 by recent guests! Pleasant, well-located, comfortable small hotel. 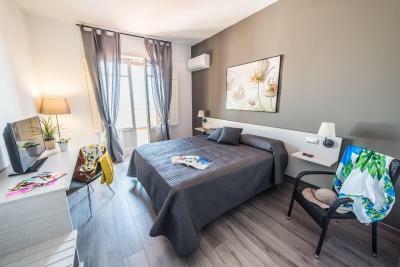 Easy walking distance to central old town area and amphitheater ruins Friendly service, helpful with early arrivals and early departures (food, secure luggage storage.) Very reasonable price for the area. Our stay was short; our experience with service at site was limited. We were pleased. The hotel met all our expectations. 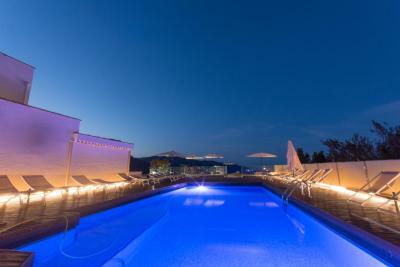 Absolutely beautiful hotel with amazing staff and extraordinary views. We loved everything and kids were so happy here! We will definitely come back and stay in this hotel!!! Great location. 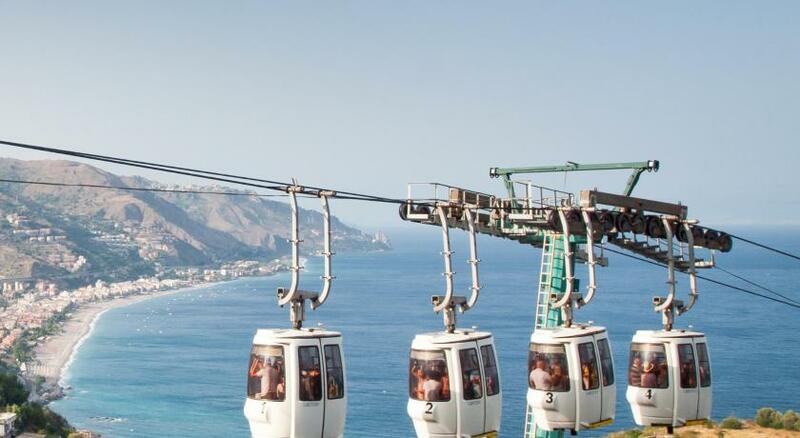 Easy access to town, cable car ride to the beach. Easy access to parking near hotel, if you have a car. Room was very comfortable. Good size, awesome views! Hotel had a lot of extra amenities - bar, pool, in-room food service. Overall excellent stay. This is a lovely hotel with lots of spaces to sit and read or watch others. It has wonderful furniture and artefacts . It has more steps than you would expect since it has a lift. Security is good. The breakfast room is really good with personalised attention and delicious home baked food. We only stayed for one night but wished we could have stayed longer. The staff was friendly and helpful. The location was perfect, right near the funicular to the beaches below including stunning Isola Bella. The room was clean and spacious and the bed was comfortable. The views were gorgeous. The parking was just a bit away and easy to manage. There was a pool that looked nice, but we didn't have time to enjoy. What an exceptional find this was! 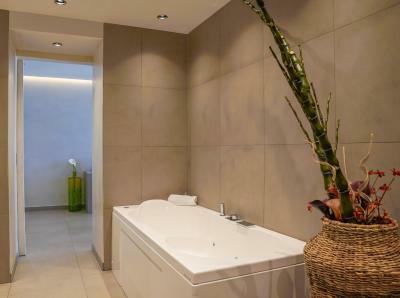 From the minute we arrived, we realised that we had made a big mistake in our travel plans to have only booked one night at this beautiful boutique hotel. 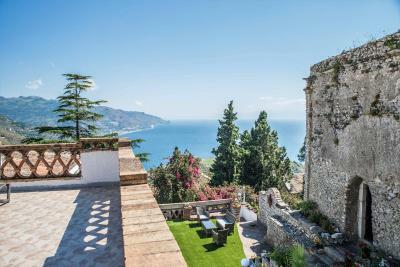 It is so worth spending a few days with Taormina as your base, and in this hotel! 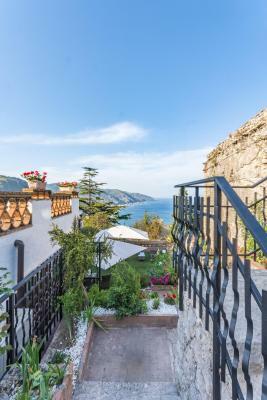 We had unknowingly booked one of the best rooms in the hotel, being right on the top level with its own glorious terrace overlooking Taormina and 180 degree sea views. 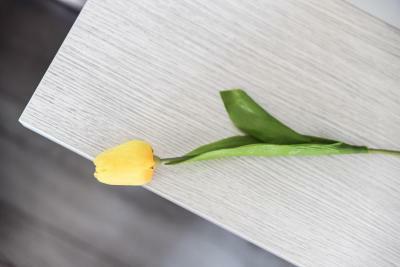 The hotel has been refurbished recently and everything is new, fresh and lovely. Our room was very well appointed - everything you could want - and that terrace!!! We were sorry we were a little late for breakfast, as we missed seeing the full spread which must have been excellent. Staff were very welcoming and helpful throughout. Thank you for a memorable stay. It is not an exaggeration to say that this is by far the best hotel that I have ever stayed at. 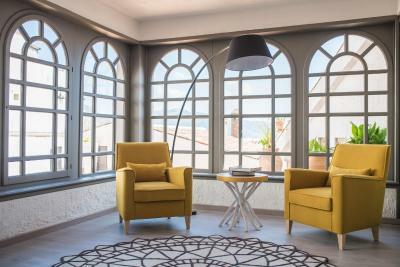 Built around ancient structure yet with modern aesthetics and comfort everywhere, this hotel is definitely designed with hotel guests in mind. 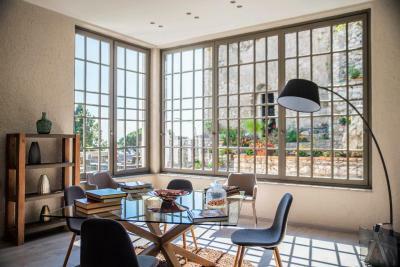 There are multiple layers of common space that are tastefully decorated. 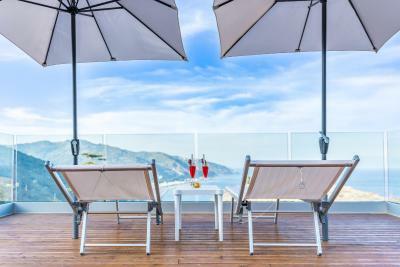 Outdoors are various seating areas taking full advantage of the great views of the Mazzaro Bay. The hotel staff was friendly and helpful, I got great restaurant recommendations from the front desk for really amazing food. The generous selection for breakfast is beyond my expectations. The hotel room was comfortable, well-appointed and clean with a spacious bathroom. 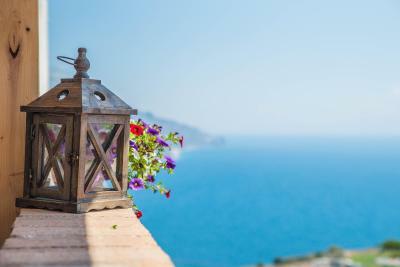 The view from our balcony is simply breathtaking! I thoroughly enjoyed every minute of my stay at this hotel. Amazing location. View from the balcony was stunning. Lucia and Luca are amazing staff. Very helpful. Highly recommend. Great hotel, beautiful view, friendly service. Very convenient to the main shopping and dining areas. Parking nearby at a (paid) private lot. 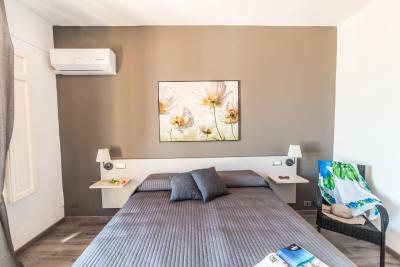 Hotel Villa Fiorita This rating is a reflection of how the property compares to the industry standard when it comes to price, facilities and services available. It's based on a self-evaluation by the property. Use this rating to help choose your stay! One of our top picks in Taormina.Housed in an antique building in the center of Taormina, Hotel Villa Fiorita features a free swimming pool and a spacious terrace, both offering panoramic sea views. 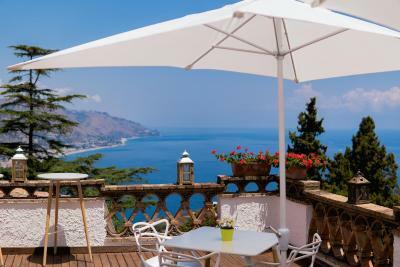 The hotel is located 250 feet from the Taormina Cable Car, with links to the beaches of Mazzarò and Isola Bella island. 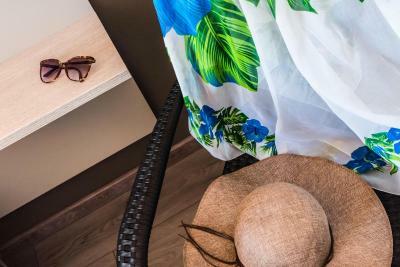 The large, air-conditioned rooms are fitted with modern furnishings. 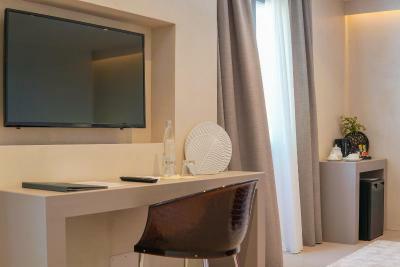 Each is provided with a TV and a fully equipped private bathroom. 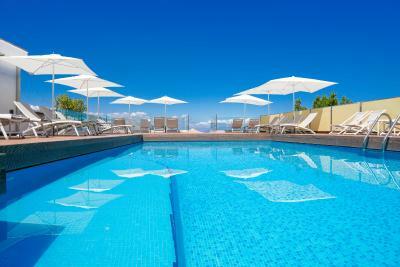 The swimming pool is located in the garden and surrounded by plenty of sun loungers and parasols. 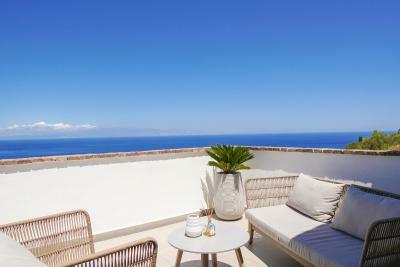 From the spacious terrace you can relax and enjoy views of the Ionian Sea. Breakfast is served daily and it includes sweet cakes, yogurt and cereal, as well as eggs, ham and fresh fruit. The popular shopping street of Corso Umberto is less than a 5-minute walk away. 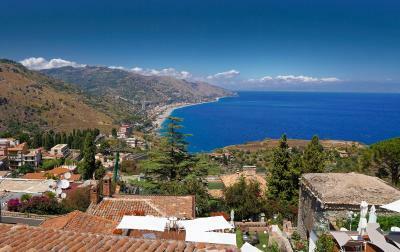 Messina is 33 mi from the property, while Catania Fontanarossa Airport is a 50-minute drive away. 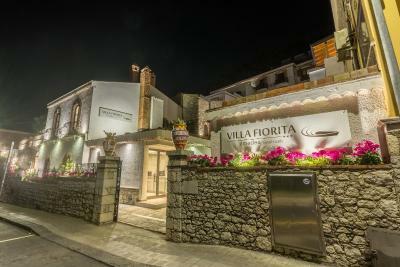 When would you like to stay at Hotel Villa Fiorita? 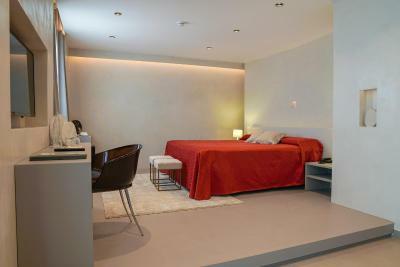 This twin room features a private entrance, air conditioning and cable TV. 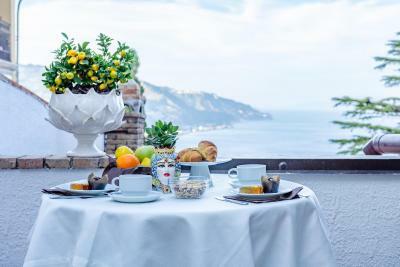 House Rules Hotel Villa Fiorita takes special requests – add in the next step! ATM card Hotel Villa Fiorita accepts these cards and reserves the right to temporarily hold an amount prior to arrival. 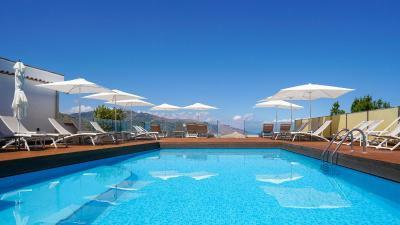 Hotel Villa Fiorita accepts these cards and reserves the right to temporarily hold an amount prior to arrival. Please note that the swimming pool is open from April until October. Please note that the elevator is available from the 2nd floor only. 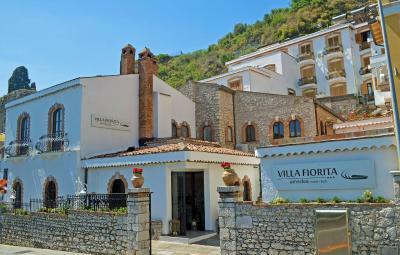 Please inform Hotel Villa Fiorita of your expected arrival time in advance. You can use the Special Requests box when booking, or contact the property directly using the contact details in your confirmation. Views from the window. Comfortable beds. Good breakfast. No elevator to first two levels above ground floor due to potential vibration disturbance of adjacent archaeological site. They do provide ready assistance with luggage, etc, but it's a drawback for some to climb those stairs. Even the very fit like an elevator ride after a long day and a few glasses of wine. This would not keep me from re-booking a stay here, but it would determine no high heels for that nice dinner. Still a very good value and great location. The very small lift and numerous stairs (though appreciate why this was so). 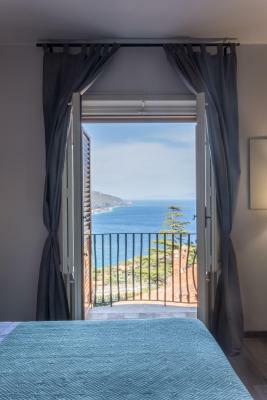 Comfortable bed; extra large terrace from which to appreciate the spectacular view. Booking.com stated the hotel had no parking . In fact it had an arrangement with a private car park just down the road. It would be helpful to have this ibformation on the website. The staff were extremely friendly and helpful, even parking our car in a nearby private car park when we arrived after a tiring journey. 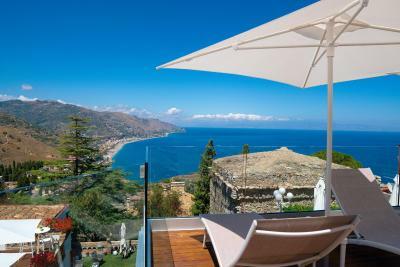 The view from our room and indeed from all rooms was magnificent , over the bay and the Straits of Messina to Italy in the far distance. Only one thing morning coffee could be better. Everything else was great, the room, the hotel, the breakfast. The staff were all very friendly and kind. Would definitely stay there again. Beautiful hotel. The staff without exception were friendly and helpful. The location was outstanding. Very friendly staff, lovely views and central location. The little extras with our Gin and tonics were a lovely surprise. The bathroom was small for the size of room we had. We upgraded to a junior suite so a larger bathroom was expected. Everything great - perhaps a negative is 15Euros a day to park car. 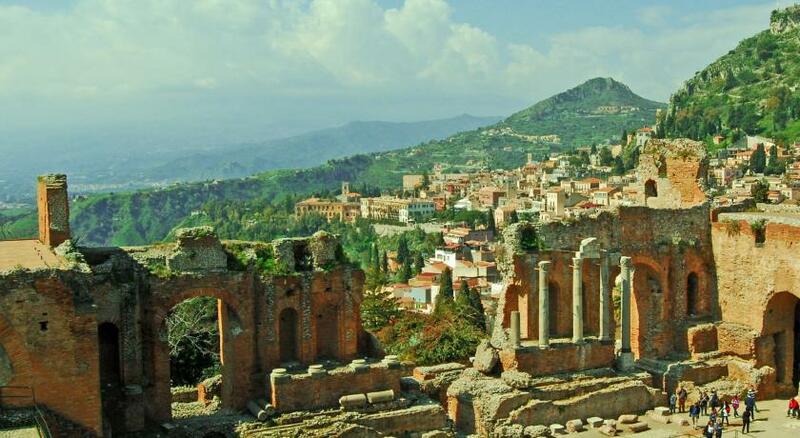 The position was great for the centre of Taormina and also 2 mins from Cable car to the beaches below. Breakfasts were very good with home made cakes and pastries particularly fantastic. I wish the pool opened earlier, 10 am was too late for a dip before setting off sightseeing. No mirror other than in the bathroom, could easily remedy this by fixing one to a walk in the bedroom. Almost everything! It was beautifully decorated, mixing the old and new. That’s why there was no lift to first three floors as cannot interfere with the ancient building. It was an interesting layout, with the different levels and terraces. Great views and nice bar area. 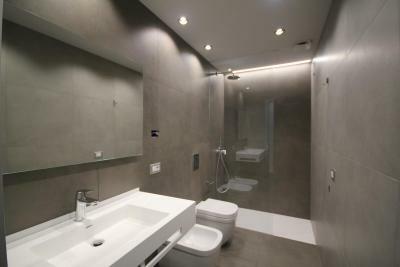 It was spotlessly clean, in an excellent location, very near to the shops etc. The staff were extremely helpful. I shall be perfectly honest here ... I have travelled the world as a press and commercial photographer, and stayed in many establishments, often gilded with false words and images in an attempt to gain your hard earned cash. This hotel was a most amazing surprise - it is exceptional ! A genuine discovery, we were most pleased about (we do a lot of homework before we book !). This hotel will not let you down and one of the best I have ever stayed in - trust me ! Cannot fault it !